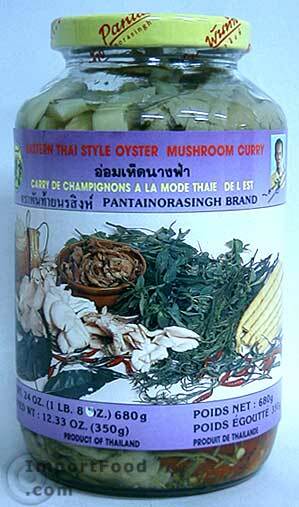 One of our most unique specialty Thai products. If you know a Thai or Lao person then this will certainly put a smile on their face, the smell is unique and not typically consistent with American aroma or flavor, but unmistakably Lao (or northeastern Thai). Simply empty the contents of this product into a pot and heat on the stovetop, we like to add sliced pumpkin (or any gourd) as shown below. Serve with nam prik kapi on the side. Packed in a glass jar. Ingredients (vegetarian): water, oyster mushroom, bamboo shoot, bai yanang, cha om, red chili, sweet basil, salt, citric acid, sodium benzoate, msg. Nice large size. Packed in well-known Pantainorasingh brand. Product of Thailand. This recipe is for a very aromatic dipping sauce that is not typically something the American nose will appreciate, but drives the Thai person wild with memories of home (see photo below). Namprik Kapi has a pungent fishy smell and lingers on your breath for hours, but it's truly "authentic" and if you know someone who boasts of being adventurous with food, see if (s)he can tolerate a dish of this. It's a wonderful accompaniment to Lao style vegetarian curry. We also offer an instant ready-made namprik kapi.